Amateur Irish cyclist Paul Healion has been killed in a car accident near Ardee, Co Louth. The 31-year-old from Dunboyne, Co Meath, was driving alone when he crashed at Glack at around 10.30pm last night. Mr Healion was due to compete as part of the seven-man national team in this week's cycling Tour of Ireland. 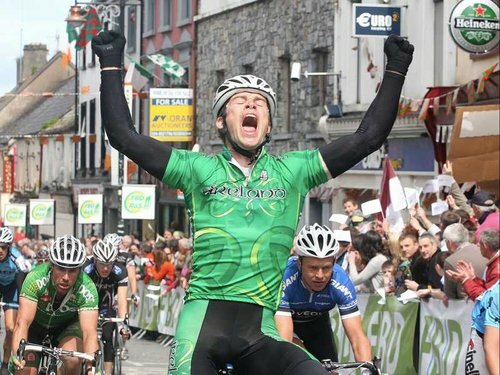 He was having his best season to date, taking a number of important results including his first ever stage victory in the FBD Insurance Rás in May as well as the National Criterium Championships in June. He was also part of the Irish team pursuit squad that finished fifth and set a new national record of four minutes 11.587 seconds in the Copenhagen Track World Cup in February. He was due to compete in the Tour of Ireland alongside David McCann, Sean Downey, Philip Lavery, Paul Griffin, Martyn Irvine and Sam Bennett, who was the other Irish stage winner in this year's Rás. Minister for Arts, Sport & Tourism Martin Cullen has extended his sympathy to the family of Paul Healion. He said Mr Healion would have quite rightly had great expectations for this weekend's cycling. Elsewhere, a 19-year-old man has been arrested after a two-car collision in Belfast. The crash happened on the Andersonstown Road shortly before 10.15pm last night. Two people were injured but their conditions are not believed to be life threatening.